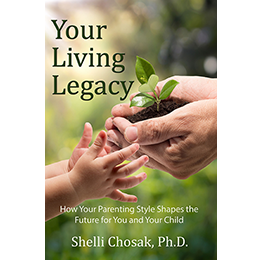 Excerpts from “Your Living Legacy: How Your Parenting Style Shapes the Future for You and Your Child”. Bringing a child into the world is a monumental gift. It’s a gift you give to yourself, and a gift you give to the future of the world—it’s your Living Legacy. Becoming a parent is also a monumental responsibility. It’s a charge and a challenge to raise a child who will feel confident, productive, and fulfilled. And to raise a child who will contribute to making the world a better place. What do you owe your child? After all, as parents often hear, “I didn’t ask to be born.” You presumably did ask for your child to be born. How can you best shape the future for you and your child? By being the best parent you can possibly be. And you likely have the best of intentions to do just that. Then why do so many best intentions go astray? Why, despite all your best efforts, do you do less than what you long to do? Because you are human. And that means you are not perfect. Or, in my definition of Perfect: “To be perfect means to know you’re not.” (Therefore, you are human.) That’s a good start to taking the pressure off, which will help make you a better parent! • The effectiveness of a given style. • The aspects of a given style that are positive for your child and your relationship. • The aspects of a given style that may detract from your child’s healthy development. • The style(s) that can be modified or utilized to address particular situations. • How your parenting style may assist or interfere with some of the lessons you want to teach your child. • What steps you might want to take to improve your relationship with your child even if she is now an adult. The following themes can occur when we are under stress–tired, preoccupied, pressured, unsure of ourselves, lacking information or confidence in ourselves or abilities. These activities consume a large amount of physical time and negative emotional energy. A more productive use of our mental efforts would be to learn how we keep ourselves from getting what we want or need, and what we can do differently. Now look at your responses. What do they tell you about your motivations to be a parent? If you rated yourself high on Nos. 6-11, you may want to re-examine your parenting aptitude if you rated yourself high on Nos. 1, 3, 4, and 12, you are more likely to become a successful parent. No. 2, “To solidify a relationship” has its positives and negatives because having a child can result in either enhancing or further stressing the relationship. A child can bring two people closer as an expression of their love for each other (No. 3) or it can drive a wedge between them, creating further stress in a relationship that may already have tension or discord. It will be helpful for your mate to complete this scale also, to determine his parenting aptitude. If one of you is ready and the other isn’t, it can create additional strain and problems in the relationship. If there are issues between the two of you, consider getting some counseling before you commit to becoming parents.